You all need to vote for us, keep up the comments and the watches. That would be Madcurl. Woohoo....yellow is winning now, keep those yellow votes coming. It does look like an amazing project, & I would love to see this on a car! This is significant, because I am She who Must be Obeyed. "Cowspatoot's white car" is actually MY car. And this yellow bumper looks pretty cool. Cool enough that its likely the only thing I would trade the bumper pad for. So yeah. I vote yellow. A good man is hard to find...but a good Fiero mechanic is "rare". I vote yellow. This project is fantastic. I really hope it becomes available. I saved these pictures from the first time you posted them. I vote White. Reminds me of a 64 Goat my best friend had back in 1966.
that one is pretty cool too!! no matter what one you choose to make i'm a winner cuz i luv em all !!!!! Yea, but if you get mesh make sure it`s powdercoat. I made the mistake of getting anodized and before I repainted it my shiny Black mesh had turned Gold. Anodizing has a Gold color undercoat and when the sun hits, it will fade the top color right off. Terry made this one for us. What do you think? arrowhead should be center and a small pontiac or nothing at all on the grill. Move the headlights to flip-ups behind the outboard sides if the grill. Like the '69 (?) Camaro. An black is my vote. This is something that I could NOT keep myself from buying. 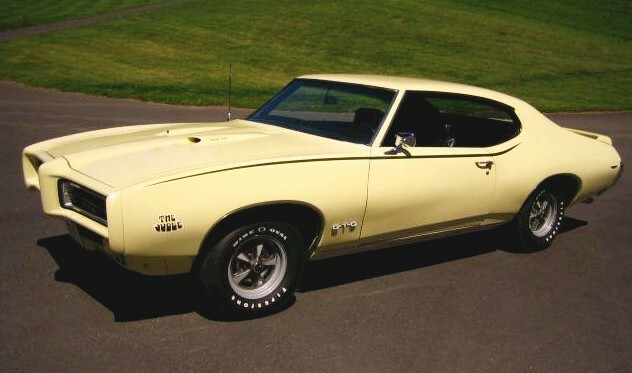 I also had a '68 Firebird and love the look, brings back memories! You'll have to ask Terry in General. He has the 50 page photoshop thread. You can't miss it. I like how the front is on this one too. The bottom chin doesn't makelook as abrupt forward. It also seems to have a wider inside grill area. The wider inside grill area seems to be what make the yellow car favorable in my eyes. If we were able to make it wider with the bottom lip coming forward but not as sharp - that would be ideal I think. How about with some variation of the 69 Judge Stripe. "FIERO" in the grile in white text similar to "GTO"
As for what goes in the openings try thick honeycomb.. I like the side badging better than the stripe. What kind of decal/badge would look good? Placement? Move the headlights to flip-ups behind the outboard sides if the grill. This would be sweet. But really if the grille is see thru you can put driving lights and parking lights behind the grille, it wont even have to move. Could keep factory lights too. 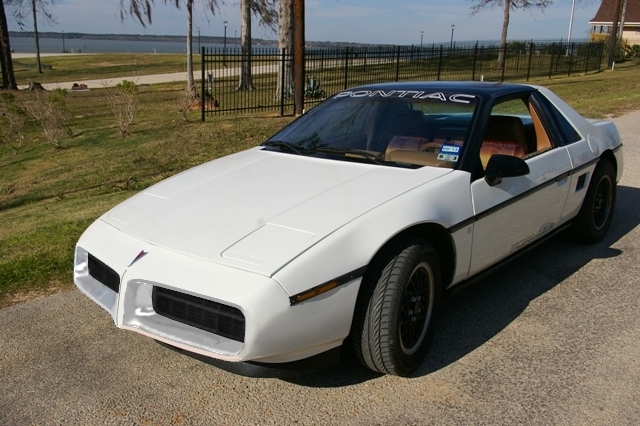 The Fiero PPG pacecars have their parking/turn signals behind the grille. What would have the decal say? 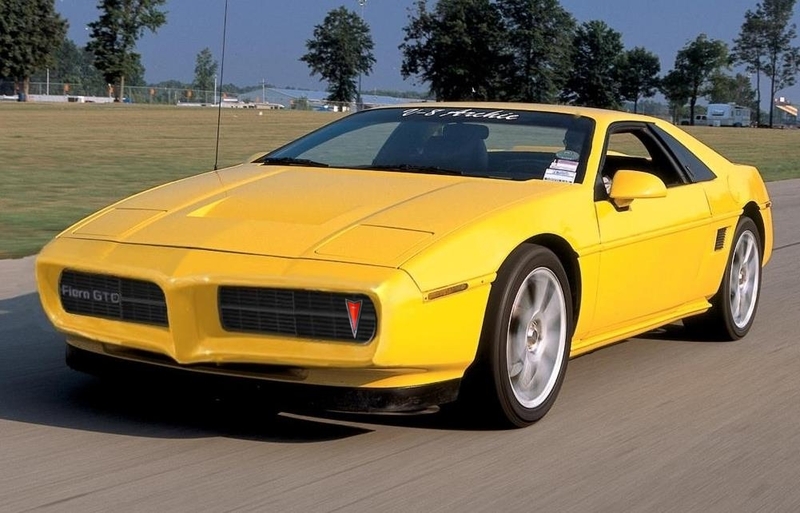 Is the Idea to make this a "Fiero GTO", or just inspired by it? I'd tend to say keep it subtle, something in the grille and a custom decklid decal similar to stock. The basic idea was to have something different that still looked like it could have been from Pontiac. I like the wide agressive "bird of prey" look that the GTOs and Firebirds had. 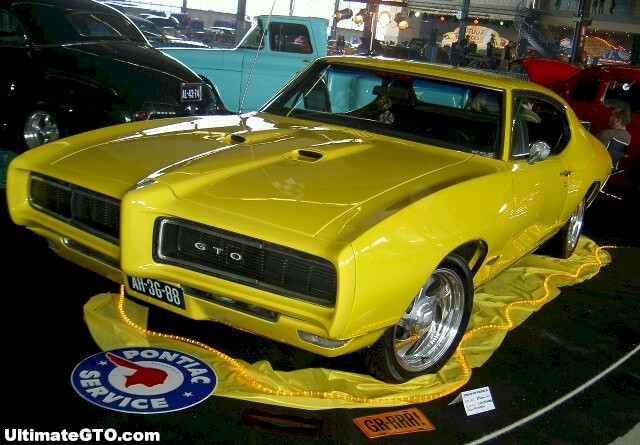 The GTO was the majority of my inspiration. I liked the front of it but hated the rear. I thought about buying a Firebird and putting the GTO nose on it since I like the rear of the 'birds. Then it hit me to modify the Fiero. I already had several, they had a wide stance, it had already been proven that different noses were a popular and relatively easy way to change its looks. Plus I like the rear of the Fiero. It just made sense to go this direction. As far as all the details of the build, we want to keep an open mind and explore all suggestions. I want to hear your ideas about badges, decals, grills, etc! How do YOU think it should look? Our current plan is to have the stock turn signals inside and behind the grill. Placement is still up in the air. We want to make everything as easy as possible so we don't want to make people splice the wiring harness or find donor lights. Another consideration is simply space. We are cutting off quite a bit of length of the car and there is a big corrugated metal crash bar in there. We are going to have to see how the lights, grills, etc work with that to form a proper space relation. This will also make it impossible for us to design a hide-away light system because it would probably require cutting. I'm sure it can be done by the right person but I don't see us addressing that. It is one of the reasons we want to make the grills interchangable, though. If the bumper is ready to accept different grills, it would be easier to adapt a light kit. Agreed, I don't think either one of us are ready to tackle that - yet. Anyway, I like the idea. However, I think we are going with the LED light trick on the head light. I have a few Ideas of how to accomplish this. I think that the LED may be a one off - depends on the complication of accomplishing it. will the grill still have the stock plastic protector part behind the new bumper? as for design i think the yellow or white with the arrowhead in the center and no other lettering or badges on it. I vote yellow! The black version just reminded me too much of the 91-92 Firebird "Bat" nose which I hated and thought ruined a good looking car.